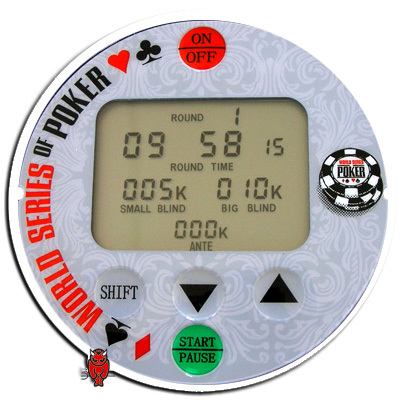 Ultimate dealer timer World Series Of Poker The ultimate accessory for all your tournaments. This dealer button has many attributes that no other buttons have. - it defines the length of each round - it defines the amount of the small and big blind - it defines the antes Thanks to its screen, which measures 4 x 3 cm, each player is perfectly able to see it during a tournament, making for a smoother and more pleasant tournament for all participants. The ultimate dealer button is supplied with French instructions. Among its other attributes, this one has: - Sound and light alarm one minute before the end of round - Time button enabling players to ask for the time, the button takes care of the countdown for you - Length of rounds are adjustable in 5-minute increments - Pause button Size: 7.5 / 1.2 cm. Weight 70 grams. More info about Ultimate dealer timer WSOP White ?